Go ahead, you can laugh, I sure am! This was rather, interesting to say the least. This hand tasted amazing however and I will make Mr. Six Fingers again sometime, hopefully he has done something about his edema by then! Halloween, to me, is a time to just have fun, be gross, eat food made into weird stuff and scare the crap out of anyone you know, who doesn't have a heart condition. We love dressing up and having fun, plain and simple. 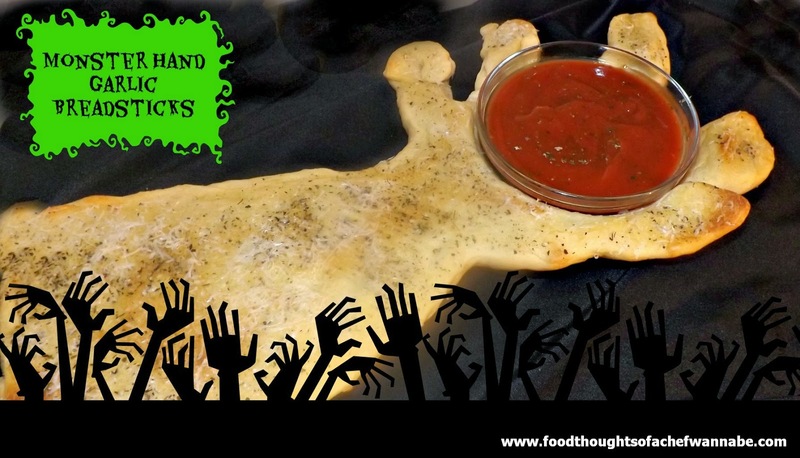 This is easy and would be a fun addition to any party table, or dinner table, the kids will love ripping his fingers off and dipping them in "blood"!! 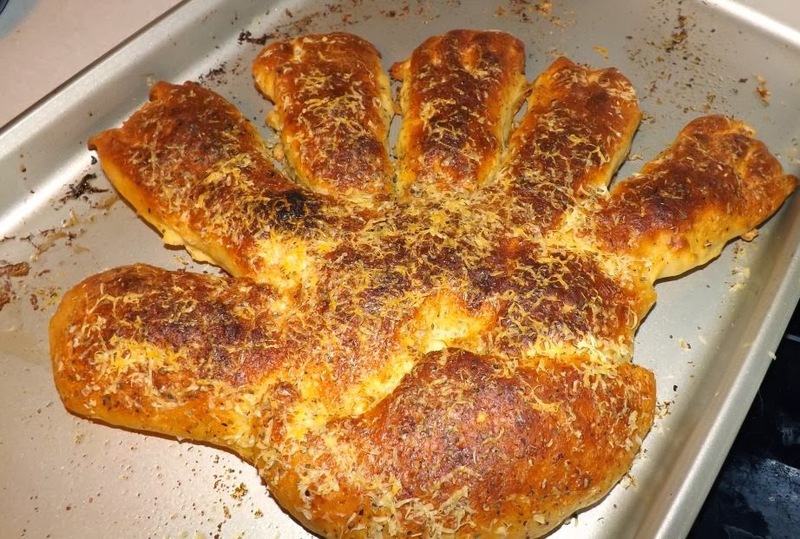 Now, drizzle with olive oil, and use a pastry brush to evenly coat the hand and arm. Bake for 10-15 minutes. You will just need to keep an eye on it because it depends on the thickness of your monsters hand! When it is perfectly browned and done, remove from the oven and let cool COMPLETELY. Do NOT remove the bowl until it is completely cooled. Now, turn your oven to broil. When it is cooled, carefully flip the hand over, remove the bowl and wash it well. Drizzle this side of the monsters hand/arm LIGHTLY with olive oil (this will be the original bottom side), combine Italian seasoning, garlic powder and salt and sprinkle all over. Lastly, sprinkle on the Parmesan cheese and place into the oven for 2 minutes (approx.) just until the top is golden brown. Each of the fingers can be another one, etc. Enjoy this fun and delicious Halloween or anytime treat!! Oh my gosh! I love these!!! Sam would love it if I made these for him!